Microsoft Project Professional 2007 ; Project Server 2007 ; Windows XP Pro and Windows 7 Pro 32-bit and 64-bit. "There is a problem with the calendar name. The calendar name does not exist. Click a calendar in the list, and then press Enter." 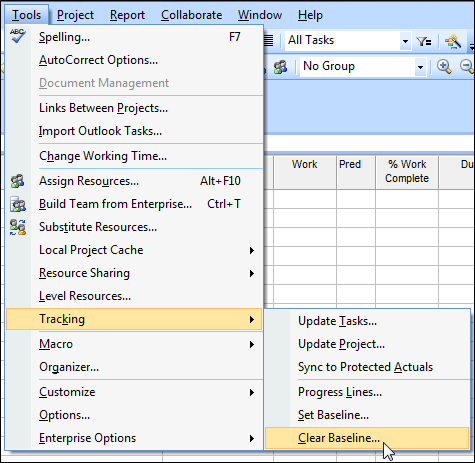 Clear your baseline: Open the project in MS Project, and click Tools > Tracking > Clear Baseline. Save your project. You may be able to set your baseline now. If you still can't, then save your project, close it and CHECK IT IN. Then close the MS Project program completely (after saving your project with cleared baseline). When you restart MS Project and reopen your project, you should be able to set your baseline. I've noticed that if I have more than one project open when I clear the baseline, I usually have to restart MS Project before I can set the baseline.